Welp, until yesterday ive never owned a Harley. Dad never owned a Harley. Grandpa never owned a Harley. We have always had jap bikes, even some of the newer retro styled cruisers. I have always kinda wanted a hardtail and when this CL ad came up, it was to good of a deal to pass up. Swapped the guy some cash for the bike and the title. I don't know how important it is, but the engine and frame are matching numbers. I don't know if that even means anything being as the frame has been cut and hardtailed. 4.) I live in Mid Ohio, the roads are straight. The only turns to be made are from one straight road to another. 3.) I am running out of room to turn around in my garage. Plan for it is to fix it enough to "own a Harley" for a minute and hopefully sell mid spring/early summer for a profit, or trade it for the next thing. I am going to search out a stock length disc brake front end to get rid of that "lean back" look and get the frame a bit more level. Also, juice brakes are good. Losing the 5 foot tall sissy bar too. If I had to label a look im going for, it will be closer to a bobber than this which I consider a chopper. Disclamer: I know that hard tails work less well than stock bike. I know that form follows function, but this is a bobber to be, so your point is invalid here. This is not nor will it be a well handling machine as compared to other bikes, but a round town, stop and talk about it bike. I will take constructive criticism, but any remarks about your opinion on hardtails in general being sub-par or non café bikes will be met with this "disclaimer" copy and pasted as a reply. I'm in. 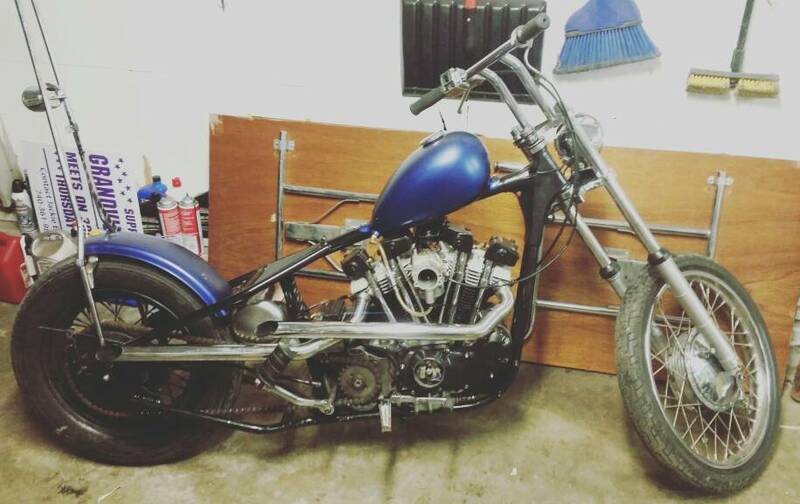 Stock height front end, ditch silly bars/sissy bars/silly tank and double your money in one fell swoop. you pretty much got my exact plan... besides the tank, I kinda like it a bit for some reason... bars are gone too, cant see in the pic but they are only like a foot and a half wide maybe. I don't see how you can even steer that thing down the road with those bars.. I suppose if push comes to shove you could simply shorten those forks and spend the budget elsewhere . Okay... now were cookin, The tank needs to go back to where ever came from, I thing the CB forks fit with all balls same as my BSA has, get a long tank and make it dead tail cruiser, ride it for grins then decide. I know that hard tails work less well than stock bike. I know that form follows function, but this is a bobber to be, so your point is invalid here. This is not nor will it be a well handling machine as compared to other bikes, but a round town, stop and talk about it bike. I will take constructive criticism, but any remarks about your opinion on hardtails in general being sub-par or non café bikes will be met with this "disclaimer" copy and pasted as a reply. Yep, that's what I'm thinking already. I have a rebuilt set of cb forks sitting here that I keep starting at. I'll probably call all balls Monday. I have drag bars I won at last year's Meltdown. I will never use those kind of handlebars. Yours if you want. Awesome! I'd be interested for sure! Are they 1"?